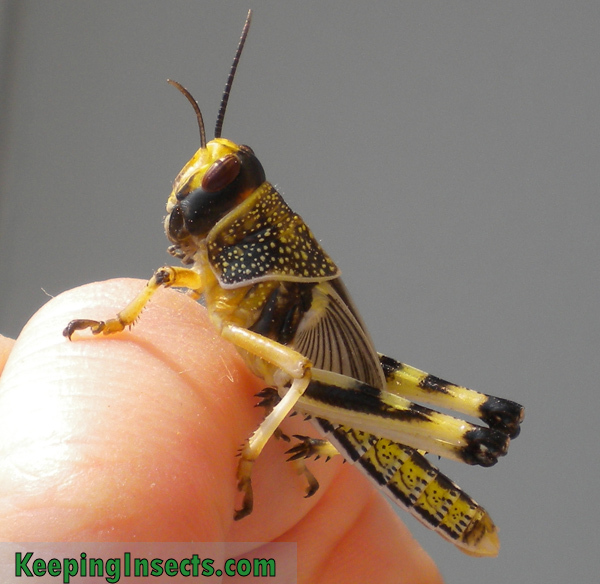 Whether or not you want to keep grasshoppers as pets or as food insects for your reptile, mantis or other pet, this page is the place for you. 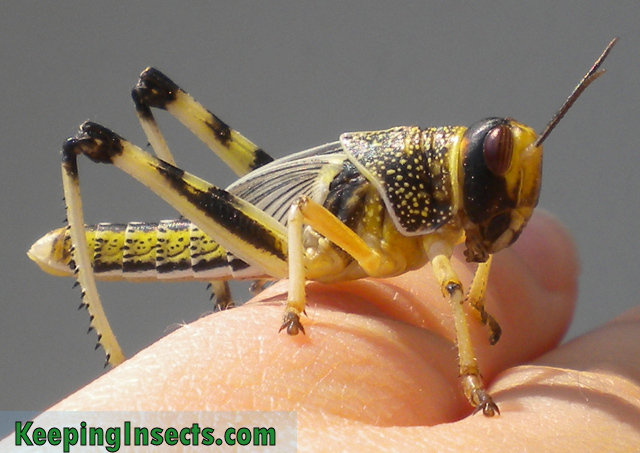 Here you can find how to take care of grasshoppers and locusts, with a special focus on the “common” pet grasshopper species Locusta migratoria and Schistocerca gregaria. You will also learn how to breed them. A grasshopper nymph. You can see it is not yet adult because of the short underdeveloped wings. 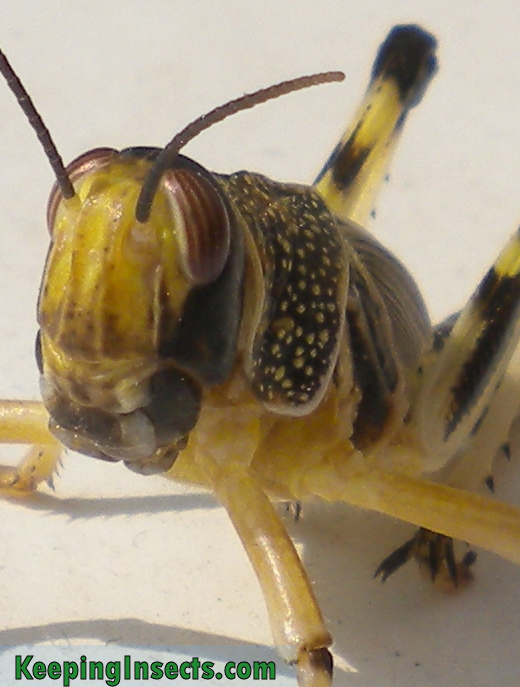 Grasshoppers fall in the order of Orthoptera, in the suborder Caelifera. 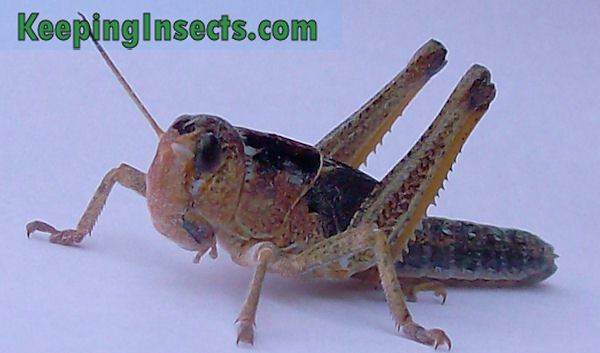 Grasshoppers are sometimes called locusts. There are many species, the most famous ones are the desert grasshoppers that also occur in the bible as one of the plagues. Both species Locusta migratoria and Schistocerca gregaria are desert grasshoppers and are in the family Acrididae. Both species reach a size of around 7 cm in length. 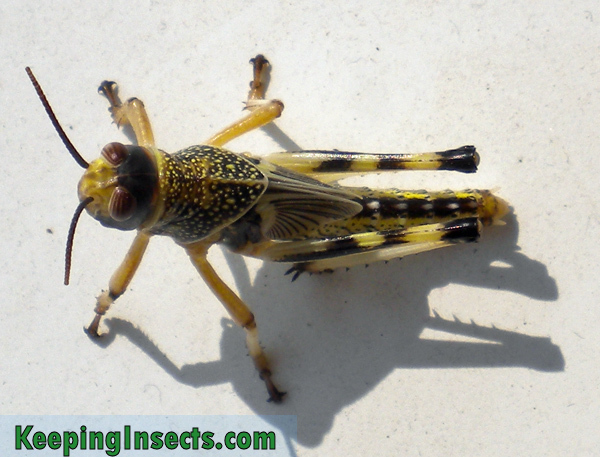 It is very easy to breed grasshoppers as long as you keep them in the right circumstances. They really need high temperature, low humidity and plenty of fresh food. If you have males and females, breeding will occur naturally. You don’t need to move the eggs or nymphs to a different container. If you like, you can of course. The nymphs are very small, so you might want to keep them in a different container than the parents to cater to their needs, prevent escaping and keep a better eye on them. If you really keep grasshoppers well, you will be awarded with a lot of young grasshoppers. Make sure this is actually what you want! If you don’t want to breed with the grasshoppers, remove the bedding with the eggs or collect the eggs and place them in the freezer. This will kill the eggs before they start to develop. Never release grasshoppers into nature. 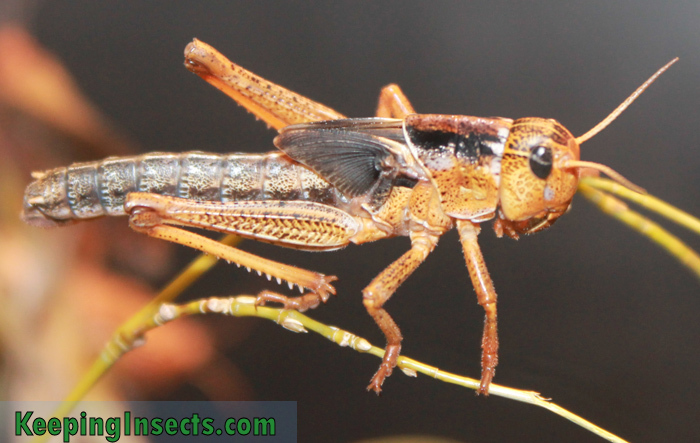 They can cause plagues, disrupt nature and compete with native grasshopper species. It’s actually very easy so buy grasshoppers. You can buy them in reptile-oriented pet shops. They are sold there as feeder animals. They are sold in different sizes, from small nymphs, to bigger nymphs and to adults. If you want to keep them for fun, you can better buy the nymphs. If you want to breed them, it’s faster to just buy the adults. 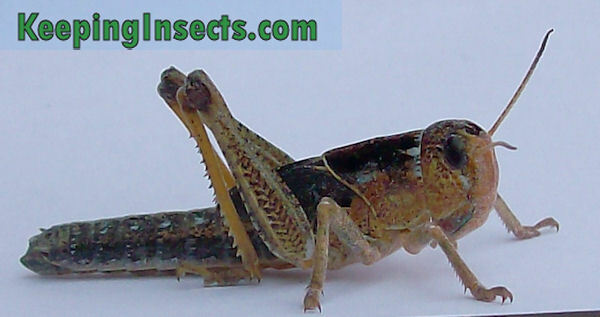 Make sure the grasshoppers look healthy when you buy them. There should not be any dead grasshoppers in the container.